The death of his firstborn saps Pharaoh’s resistance, and he commands Moses and Aaron to leave Egypt immediately. But not before seeking a blessing from the Lord! Fearing for their lives, the Egyptians beg the country’s former slaves to leave, also. Instructed by God, the Israelites ask for valuable articles of silver, gold, and clothing—a partial repayment for years of slavery—and the Egyptians are only too happy to oblige. As they prepare to leave, Moses makes sure he has the bones of Joseph, since they are under solemn oath to bury him in Canaan. The closest route to Canaan takes them some 160 miles north, along the eastern coast of the Mediterranean. But because they would have to fight the Philistines along the way, the Lord leads them south by a puzzling route toward the Red Sea. He appears to His people literally as a pillar of cloud by day to shade them, and as a pillar of fire by night, providing light and heat in the cold desert. God also supernaturally guides them through the cloud. This symbolism is used often elsewhere—such as the burning bush and the Shekinah presence in the tabernacle. Suddenly the Lord tells Moses to change course and camp before Pi-hahiroth. Learning this, Pharaoh thinks the Israelites have lost their way, prepares all his chariots, and sets out in pursuit! Suddenly, the cloud moves between Pharaoh’s chariots and the Israelites. Thick darkness envelops the Egyptians on one side, even as light shines on God’s people. 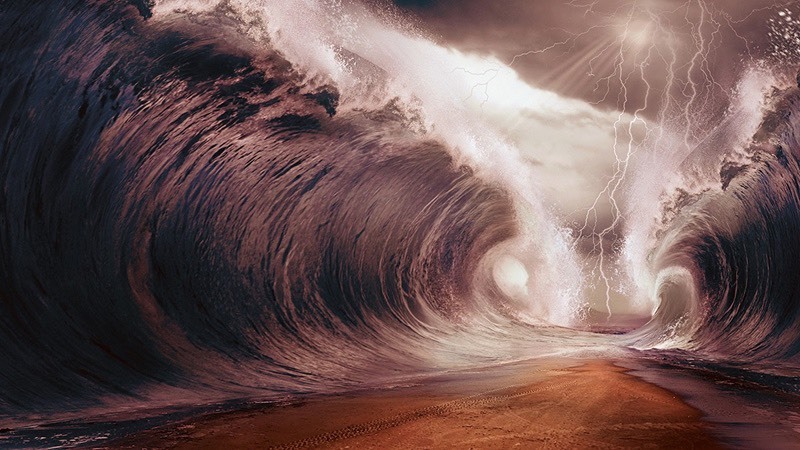 At the Lord’s command, Moses stretches his rod over the sea and a strong east wind blows the water into two towering walls, drying the seabed. As the cloud lifts in the morning, the Egyptians see the last of their prey escaping and rush in after them. But God looks down through the cloud and rips their chariot wheels off! Realizing the Lord is fighting this battle, the Egyptians retreat, but it’s too late—the walls crash down and they all drown! God has delivered His final message. He is the true God, and He’s executed final judgment. Although this great victory is told in narrative, many of Scripture’s greatest triumphs are written in verse, since ancients understand that poetry is meant to be memorized and recited. Moses leads the triumphant song, and Miriam and the women answer antiphonally as the music echoes over the sea, the desert, and the mountains!